After the podium ceremony, Schurter talked about racing the Tour de Romandie and the Tour de Suisse with ProTour road team ORICA-GreenEDGE: "It was an awesome experience for me. It was nice to see once that world. It was especially important for me to see once if it is something I would like to do as well. I had a chance to do two big races and to see how it is going there. 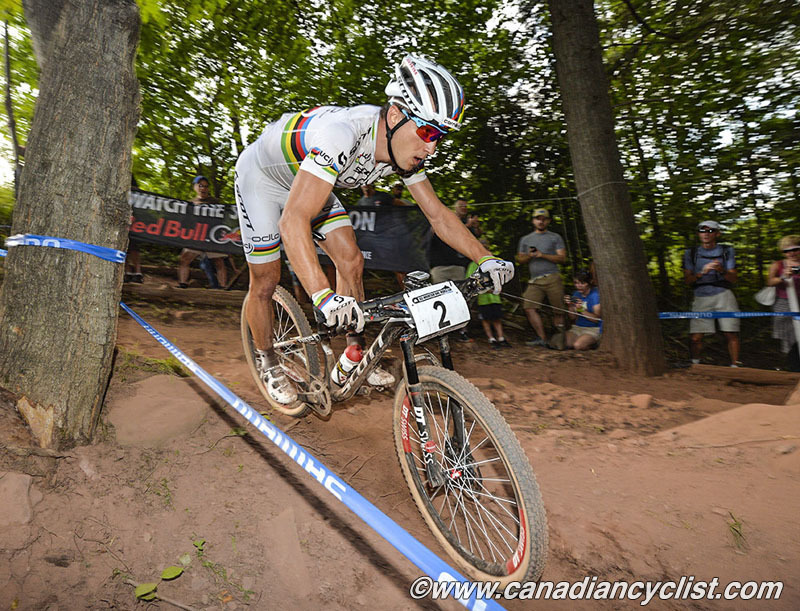 Definitely until 2016 I'm on the mountain bike and after that for me it's open what I want to do." "Mountain bike is really intensive but short and on the road you never go that hard like in a mountain bike race but you have to perform over a longer distance and that's totally different. I would say it's not possible to do both at the same time at the highest level, but that wasn't my goal. It was more to see once how that world is going and what they are doing and if it's maybe something I would like to do as well." "Normally you are not allowed to have two licenses from different teams. It was quite a bit of work to get permission to do this so probably it's not going to work again but maybe some smaller races. If there's once again the chance to ride again it would be awesome. The team ORICA-GreenEDGE was super-happy and they will take me always again. It's just a question about the license."